It takes a lot of courage to face and work on our challenges, and I feel really fortunate to be able to partner with families as they make positive changes in their lives. Growing up and parenting certainly come with highs and lows, and I believe kids and families really need to know that they have someone in their corner when they are going through a difficult time and that asking for help is okay. When working one-on-one with children, I really focus on setting kids up to be successful – teaching, practicing, and reinforcing new skills – so that they see they are strong and capable of coping with negative emotions and solving problems in pro-social ways. I also empower parents to build positive relationships with their children through Parent-Child Interaction Therapy and other parenting programs. Helping families become strong and emotionally healthy is the most rewarding thing I can do." 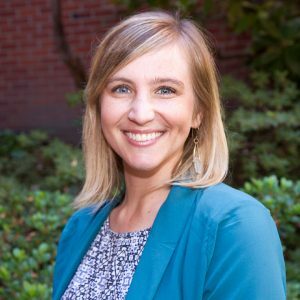 Dr. Grady is a licensed psychologist who provides evidence-based assessment and cognitive-behavioral interventions for children and families at the NW office. Dr. Grady takes a positive, strengths-based approach to helping kids and parents understand, accept, and cope with challenges and changes in their lives. Borrowed from renowned psychologist Dr. Ross Greene, Dr. Grady believes that “kids do well if they can” and that the most effective way to teach kids new habits of thinking and behaving is to create opportunities for children to experience behavioral success. Creating a safe, supportive, and motivating space for kids (and parents!) to learn and practice new skills and strategies so they have the tools to make their own lives better is Dr. Grady’s ultimate goal in treatment. Dr. Grady also specializes in Parent-Child Interaction Therapy (PCIT), a treatment focused on coaching parents to build positive relationships and use behavior management techniques with their young children. These first relationships are the most important ones in a child’s life, and Dr. Grady is consistently inspired by how the PCIT program helps parents to feel more empowered, connected, and effective in parenting their children. Pediatric psychologists truly have the best gig – not only do they get to make a difference in people’s lives, they also get to have a lot of fun doing it! Play and laughter are healing, especially for children, and Dr. Grady loves that she gets to bring silliness, smiles, and play to her work with kids and families. Other perks of the job include meeting all different kinds of families, hearing their stories, and witnessing the awesome ways they grow! Outside of work, Dr. Grady recharges by practicing hot yoga, listening to old soul music, perusing Powell’s, and hanging out in coffee shops. Life with husband Danny and 2½-year-old son Jojo is sweet and very entertaining! The family of three enjoys throwing dance parties in the kitchen, playing lacrosse in the backyard, and road tripping in their vintage 1988 rainbow-striped Land Cruiser, which receives a lot compliments! Raised in Oregon, Dr. Grady is excited to return after having spent the past decade in Seattle. Adventures to the mountains, rivers, and beaches around Portland will be happening soon! "Cannot speak to the greatness of the other doctors, but Drs. Meyer and Grady have an amazing manner with our daughter, really attend to concerns, and provide great advice and treatments from a trauma-informed and compassionate attitude. The desk and nursing staff are friendly as-all-get-out and the saltwater fish tank, kids' books and toys make the short wait times even better."